After years of traveling, I’ve stayed in many different accommodations. But my cabin aboard the Celestyal Crystal has a feature I have never seen before. My room has twin beds. Across from the beds is a large full-length mirror. Next to the mirror is a curtain on an aluminum rod to pull across the mirror to hide it. Each evening at turndown, the cabin attendant draws that curtain, leaves a towel creation (my favorite so far has been the swan) on my bed along with a wrapped chocolate and a copy of the next day’s ship newsletter. I don’t know if the cabin attendant thinks I will be shocked to awaken in the morning and see myself looking back at myself in the mirror. Strange but handy to have a tall mirror to check if I am dressed correctly. The 1,200-passenger Celestyal Crystal is 37 years old but has undergone several major renovations and is a clean, well-maintained ship. The décor is simple but elegant. 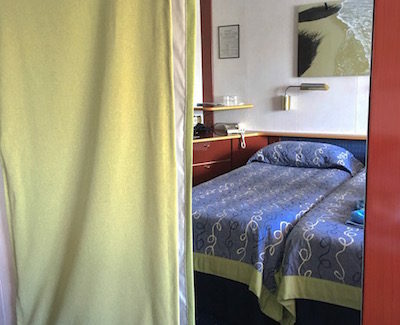 One of the latest renovations was to add new balconies for some of the 476 staterooms. My cabin doesn’t have a balcony but does have a large picture window. It also has a fair amount of room, especially since I am a solo traveler. It has a sofa, comfy chair, coffee table, flat screen TV, phone, mini fridge, desk with straight-back chair, big closet, hair dryer, safe, robe and more drawers than I need. Crystal is a small ship by today’s standards but it has a big ship feel while still offering easy movement between the decks so you can get almost any place in a matter of minutes. I really appreciate that advantage. The ship has 10 decks, named after Greek gods, such as Zeus, Athena, Poseidon and Hermes. I’m on Deck 7 Apollo. The ship has a good-sized duty-free shop selling souvenirs, toiletries, snacks, jewelry, liquor and clothing. The ship also has a small casino, medical center, photo shop, excursion desk and well-equipped fitness center. The beauty salon offers standard treatments in lovely private rooms, along with a tiny sauna and steam bath and roomy showers. I had a 30-minute aromatherapy massage this morning and it was delightful. Providing good seating with cocktail tables for drinks and snacks, the large Muses Lounge theater is where shows and programs are presented. I don’t think there is a bad seat in the theater. I have sat in the front and in the back and have had no trouble seeing or hearing. The Eros Lounge & Piano Bar on Deck 8 also has comfortable seating and tables and is where the ship’s violinist and pianist often perform. The Horizons Bar on Deck 10 is a wonderful place to watch the ocean and enjoy a mojito or drink of choice, including a Hemingway favorite. The drink menu is quite large and serves the best mojitos I’ve ever had. That opinion is shared by several other passengers who may be more expert at mojitos than I am. Deck 9 has a swimming pool and hot tub, plus a bar. The ship has two restaurants – Amalthia and Olympus. Of course, any ship is only as good as its crew and the Crystal boasts some of the best. From ship Captain Nikolaos Vasileiou and energetic cruise director Danny to talented dance teacher Martha and destination expert Dr. Jorge Arocha, all the people I have met are friendly, professional and helpful. Cabin attendants always seem to be busy cleaning something or bidding me a “Good day.” Dining room staff seem to know what drinks we prefer and where we like to sit. I don’t know how they do it but on my first day, crewmembers knew my name. Always felt like coming home to walk back onto the ship.